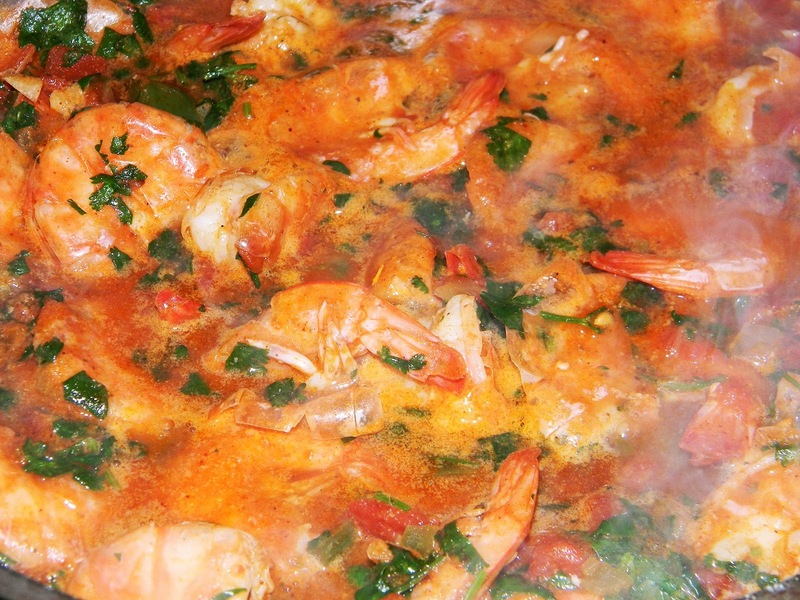 My teenage son came to me and asked how to make a Mexican shrimp recipe the other day. I was a bit surprised...he was, after all, not simply asking what there is to eat (or why there's "nothing" in the fridge) or what time dinner is ready. I'm joking, of course, I feel blessed to have him as my son and to be his father. But he did ask me how to make Mexican shrimp. The reason he asked this was he has to make a Spanish recipe for his high school Spanish class. He has to prepare it in front of the class so we kept it flavorful but simple; he also had to translate it into Spanish (thus, the bilingual recipe below). He did all the chopping and cooking; I just talked him through it. He has a great sense of humor...it stands out in step 8 of the instructions. Anyhow, I thought I'd post the recipe not only because I am proud of him, but also because it is simple to make and really delicious. We ate it over brown rice that I cooked in chicken broth with garlic. The recipe will serve 4 people. 7. Agregue jugo de limón y el cilantro y disfruta! 7. 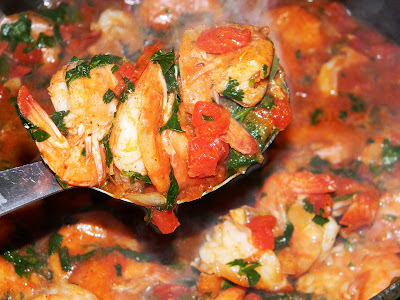 Add lime juice and cilantro and enjoy! I was intrigued by the recipe when you posted it but I had already pre-prepared a lot of meals for the week due to a busy schedule. I finally got a chance to cook tonight and we really enjoyed it. Simple,tasty and quite healthy. Yes we remembered to eat our vegetables. Next up - carnitas de pollo. On a similar note, for our Christmas Eve family get together. My son made beef tostadas and my daughter made David Chang's steamed buns with pork belly. Two non traditional items to balance my annual lentil and sausage soup. I always look forward to the recipes. You even have me thinking of doing the Ezekial bread. Kevin...awesome, thanks. And I told Isaac you made the recipe as well. Let me know if you try the Ezekiel bread recipe. I hope you're staying warm up in T.O., we got our first blast of snow and cold today.